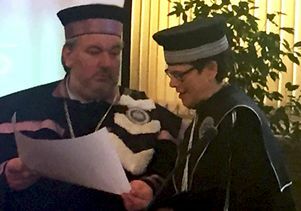 Gail Kligman reading the decree that awarded her the honorary degree. Gail Kligman, distinguished professor of sociology and associate vice provost of the UCLA International Institute, was awarded an honorary doctorate by the Universitatea Babeș-Bolyai of Cluj-Napoca, Romania. Kligman was contacted over a year ago by the chair of the faculty of sociology and social welfare at the Universitatea Babeș-Bolyai, who informed her that the faculty wanted to nominate her to receive an honorary doctorate from the university. Unlike in the United States, honorary doctorates are awarded apart from commencement ceremonies in Romania. Over several days, she met with the faculty of sociology and social welfare, spent two hours in a question-and-answer session with some 50 students, and was hosted at lunches by members of the faculty. The ceremony was held May 25, 2017. Read the full story on the Internationl Institute website.